Even in its new expanded place Podnah’s is far from a fancy restaurant. Though the outside has been so slicked up I thought it was a new building, but in contrast to the exterior the inside shows it still has an old heart. It’s 3-4 times the size his original restaurant, but still has the barbecue house feel. There is a large bar area where one can comfortably eat alone, and a serviceable area to wait on busy nights. A combination of wood and cracked concrete floors and a mix of schoolhouse and faux industrial lights compound the feel. During the daytime, natural light pours through big skylights and a wall of windows along the street. The combination of wood floors, wood countertops and the bricked-lined bar gives a natural warmth. Those of you who grew up in the 50’s will recognize the Formica topped tables, but his original chairs have thankfully been replaced. Unfortunately the bench seating along some of the walls is (currently) lacking any sort of back support and gets uncomfortable by the end of dinner. Regulars will be glad to know there is actually room to wait for a table without being trampled by busy servers. Pok Pok Noi (Little Pok Pok) will be a mostly take-out joint with some outdoor and counter seating. On offer will be the original shack menu plus a few of the other favorites from the full Pok Pok menu, such as Neua Naam Tok, Muu Paa Kham Waan and Sii Khrong Muu Yaang. (Doing the full menu in this space would be logistically close to impossible, so sorry– only the greatest hits!) There will be a full liquor license which will allow us to sell bottled beer to go, and our house made drinking vinegars will be featured both for on-premise consumption and to go. We plan on being open for lunch and dinner, 7 days a week. 1625 NE Killingsworth, Portland OR. Category: Portland Food and Restaurant News and Discussion. Related posts about Podnah's Pit BBQ, Pok Pok Noi Restaurant. Nice to re-read the 2007 review. Can’t wait to try the new spot. Was the pecan pie just as good? Will the prime rib be a regular item? Breakfast Lunch Dinner- AND a seat in the house finally….what’s not to love about this new spot!! Not sure how that works but this was my second visit but the first to the new place which was such an improvement over the old. But you have to start out somewhere. My first review was more in favor of the place but something was different this time. Might be because this is the first time I have eaten meat from the newer smoker since last time. I ordered the brisket plate with a rib added, pinto beans and the potato salad. Now, Portland is not a bbq mecca so i figure any good bbq has to be special. And it was good. Actually, the best place I have found yet in Portland but I am not done looking. And it is Texas BBQ. That is not the same as you find back east and you can’t really compare it to that. But the first time I went, the brisket was to die for. Awesome bark on the outside and very tender. This time, it was good but not the same as he got out of the older smoker. It tasted like he used the same rub on the ribs and they too were good. Not great but good and I will go back. 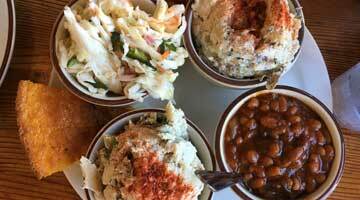 As for the sides, the potato salad was also different than before. Less potatoes and more other ingredients. Pinto beans were good and the cornbread tasted like someone spilled the salt shaker in it. After spending many years learning how to slow smoke meat Texas style, I still prefer mine but I don’t always have 14 hours to spend making dinner and this wasn’t a bad substitute. You might want to give Slabtown BBQ at NW 26th and Vaughn a try. It’s hard for me to determine which I like more between it and Podnah’s. I think they both do a great job with brisket. Podnah’s new space is a huge improvement and it looked like it was already being put to good use when I went for lunch on the first Saturday that they were open. oh boy…Slabtown? laughable. It’s a shame what happens to meat in that place….